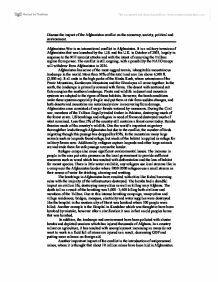 Discuss the impact of the Afghanistan conflict on the economy, society, political and environment. Discuss the impact of the Afghanistan conflict on the economy, society, political and environment. Afghanistan War is an international conflict in Afghanistan. It is a military invasion of Afghanistan that was launched by the U.S. and the U.K. in October of 2001, largely in response to the 9/11 terrorist attacks and with the intent of removing the Taliban regime from power. The conflict is still ongoing, with a possibility the NATO troops will withdraw from Afghanistan in 2014. Afghanistan has some of the most rugged terrain, inhospitable mountainous landscape in the world. More than 50% of the total land area lies above 6,500 ft. (2,000 m). It all ends in the high peaks of the Hindu Kush, where extensions of the Pamir Mountains, Karakorum Mountains and the Himalayas all come together. In the north, the landscape is primarily covered with farms. The desert with scattered salt flats occupies the southern landscape. Plants and wildlife in desert and mountain systems are adapted to the rigors of these habitats. However, the harsh conditions make these systems especially fragile and put them at risk from sudden changes, and both deserts and mountains are notoriously slow in recovering from damage. Afghanistan once consisted of major forests watered by monsoons. During the Civil war, members of the Taliban illegally traded timber in Pakistan, destroying much of the forest cover. ...read more. The life expectancy for the average Afghan has dropped significantly to 44. The war has lowered people's life expectancies as the death rate and life expectancy rates highlight. During the Taliban rule, the role of women was domestic and had little rights. Women could not be educated or enter employment and those who defied the Taliban were punished extremely, with some women being publically executed. However after the Taliban's fall from power, women's rights have increased with women returning to education and employment. Education has greatly improved in Afghanistan since 2001, where more than 5.4 million children returned to school with nearly 35% of them girls. However it is still estimated 11 million Afghans are still illiterate. Many schools lack funding so have poor facilities and the number of qualified teachers is low and cultural bias that many Afghans have against educating women still needs to be overcome. Since the invasion of 2001 the economy of Afghanistan has improved significantly due to a mixture of billions of US dollars in international assistance and investments. It is also due to dramatic improvements in agricultural production and the end of a four-year drought in most of the country. However, Afghanistan still remains one of the poorest and least developed countries in the world that is highly dependent on foreign aid. The Afghan economy is significantly dependent on agriculture as most of the land is cultivated. ...read more. Another impact is the loss of vital workers which deters development and progress of the country. After the invasion, the Taliban was removed from power and a democratic government was set up with free elections to elect the President. There were two elections, where both women and men voted and Karzai was elected President, showing democracy was established and working. However it was soon emerged the elections were fixed and the new government was corrupt, weakening the new system of Government. It also encouraged many Afghans to align themselves with the Taliban who were seen as a more stable government. NATO forces are trying to strengthen the fragile democracy in Afghanistan by holding international conferences. Furthermore after the Taliban regime came to an end in Afghanistan, members were pushed into Pakistan, where the gained support of northern Pakistan. Their control spread over the country till they were only an hour from Islamabad. The Taliban's presence destabilised Pakistan, and the army pushed them back northwards to the Hindu Kush Mountains. In conclusion the Afghanistan conflict has had both a positive and negative impact on Afghanistan and the people. The conflict has ended the Taliban rule which meant many Afghans benefitted as they were free from persecution. The education, economy, political and social impacts have generally improved. However there are some drawbacks such as the Government being corrupt and rigged elections and its extreme reliance on Aid. ...read more. �410m Other Ethnic �175m �242m Other Fast Food �141m �180m This clearly shows that overall consumer spending has increased in the catering industry, also I can clearly see that despite other facilities being open the traditional Pub meal is still the highest earner. Also if African nations plan on lifting out of poverty they will need some sort of debt relief because most African nations have accumulated huge debts that they are unable to pay back, however some countries are against giving Africa any sort of debt relief. * Anambra State Cluster Development Project- IFC states its objective here as being: to improve the performance of small and medium size enterprises in the clusters in Abia and Anambra states (Eastern Nigeria) through policy reform, more efficient horizontal and vertical firm linkages, and expanded access to business development services and financial resources. 'There is nothing in the Montessori prepared environment that is there by chance.' Discuss. must be removed from it as well. "- Lillard, PP, Montessori A Modern approach, Chap 3, The Montessori Method, page 50. Crucial, but different in every stage A prepared environment is crucial for every stage of development of the child but the characteristics of the prepared environment changes with the needs of the child as he grows. However some of the police officers are easily bribed so NATO forces have to keep a look about for corruption and prevent it happening. The check points are not as efficient as members of the Taliban use the side roads to enter the cities rather than the main roads into the city. In industrial countries, mass tourism and recreation are now fast overtaking the extractive industries as the largest threat to mountain communities and environments. Since 1945, visits to the 10 most popular mountainous national parks in the United States have increased twelve-fold.